One of the biggest offseason questions has finally been answered: After 14 seasons in Dallas, and with speculation looming that quarterback Tony Romo would be traded or released to continue his NFL career, the quarterback will instead join CBS Sports as its lead NFL game analyst beginning with the 2017-2018 NFL season, the network announced Tuesday . But the start of free agency came and went, and Romo remained on the Cowboys with no sign of progress in sight. He reportedly took Jones’ perceived foot-dragging personally, though Jones denies this. Either way, it’s Jones’ words from early March, when he was discussing that he and Romo had an understanding that the quarterback would not sign with the rival Redskins, that have proved most prophetic , even if accidentally so. "It was a very difficult decision. I went back and forth a number of times," Romo said on a conference call. Romo said the Houston Texans were at the top of his wish list if he kept playing, but the CBS offer was too good to pass up. "It really had nothing to do with the Texans and everything to do with CBS," Romo said. "I felt like it was the right decision. My wife would tell you we've had a lot of late nights. It was nice to have some clarity." "Going from one legendary team to another as I begin the next phase of my career is a dream come true," Romo said in a statement. "I have always known that once my playing career was over I wanted to become a broadcaster. I am ecstatic for the opportunity to work with Jim as I learn the craft and convey to fans my passion for this great game." Romo said on the conference call that he expects his new broadcasting job to be difficult, but "I've got to attack this just like football." The Cowboys' move to make Romo a post-June 1 release designation softens the blow against the salary cap this season. Instead of counting $24.7 million against the cap in 2017, Romo would count $10.7 million this year and $8.9 million in 2018. The Cowboys would gain $14 million in cap space this season, but it would not become available until June 2. The Cowboys will carry $19.6 million in dead money for the 2017 season, $8.9 million in 2018 and $3.2 million in 2019. Romo's decision came down to his health, sources close to the situation told ESPN. Romo, who turns 37 on April 21, believes his family and his health are paramount. He was limited to playing in parts of just five games over the past two seasons because of collarbone and back injuries, and he suffered a compression fracture in his back in August that led the way to Dak Prescott's emergence. Prescott posted his thanks to Romo on Instagram. Romo now will get to spend more time with his family while retaining a strong connection to the game. As the network's No. 1 color commentator for the NFL, Romo will work with Nantz on Sunday afternoon and Thursday evening games. He also will be in line to work CBS' coverage of Super Bowl LIII in Atlanta in February 2019. 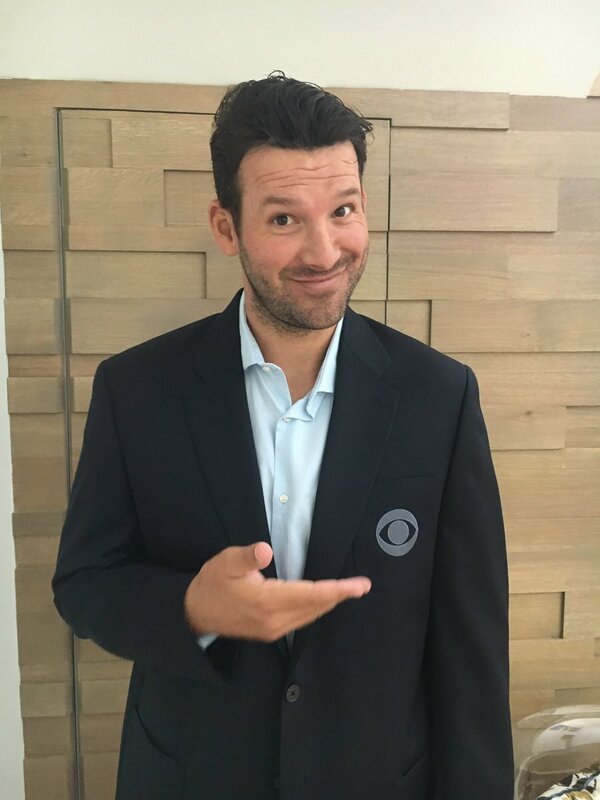 Romo -- a scratch golfer -- also could wind up working on CBS' golf coverage down the line, sources told ESPN, but he first wants to focus on football. "Tony has been one of the NFL's biggest stars for the past decade, and we are thrilled to welcome him to CBS Sports," CBS Sports chairman Sean McManus said in a statement. "He will bring the same passion, enthusiasm and knowledge that he displayed on the field to the broadcast booth. He brings a fresh and insightful perspective to our viewers having just stepped off the field. We know Tony will quickly develop into a terrific analyst, and alongside Jim Nantz, will become a must-listen for fans each week." CBS said it was discussing future options for Simms, who served nearly 20 years as the network's lead NFL analyst. Romo stepping away from the game affects numerous NFL teams since the market for Romo was expected to be robust. Romo no longer will be a consideration for the Texans and Denver Broncos -- unless he were to unexpectedly return from the broadcast booth to the playing field. However, a source directly involved told ESPN's Ed Werder, "He's done. It's over. This was a no-brainer." Without Romo, the Cowboys' all-time leader in passing yards and touchdowns, Tom Savage now is expected to be Houston's starting quarterback, with former Cowboys quarterback Brandon Weeden serving as his backup. In Denver, Trevor Siemian and Paxton Lynch will compete for the Broncos' starting quarterback job. Romo's transition to TV will finish off one of the great undrafted free-agent stories in NFL history. In 2003, Romo bypassed a larger signing bonus from the Broncos to join the Cowboys out of Eastern Illinois. He did not throw a pass in a regular-season game during his first three seasons, but coach Bill Parcells turned to him in the sixth game of the 2006 season at halftime against the New York Giants. Romo then sparked the Cowboys to a playoff berth and held the starting job through last August. In his first full season as the starter in 2007, Romo threw for a then-franchise-record 4,211 yards -- a mark he would surpass twice more -- and a franchise-record 36 touchdown passes. The Cowboys finished with the best record in the NFC (13-3) but lost in the divisional round of the playoffs. Romo has a career record of 78-49 but never was able to get the Cowboys past the divisional round in four playoff appearances. His 34,183 passing yards and 248 touchdown passes are the most in team history. Romo also holds team records for 300-yard passing games (46), games with multiple touchdown passes (79) and consecutive games with a touchdown pass (38). In 2012, he threw for a club-record 4,903 yards, and on Oct. 6, 2013, against the Broncos, he threw for a franchise record 506 yards. He has the NFL record with a touchdown pass in 41 straight road games. "Tony Romo has a unique combination of athletic ability, arm talent, vision, and instincts for the game," Cowboys coach Jason Garrett said in a statement. "What separates Tony from many other players, however, is a rare competitive spirit. Tony loves to play. Tony loves to compete. The best ones always do. In practice. During games. On the field. Off the field. Tony competes to the end in everything that he does. That relentless spirit that Tony plays with is contagious. He makes his teammates better. He makes his coaches better. He makes his team better." In 2013, back injuries started to slow Romo. He had two back surgeries, including a discectomy before the season finale. He suffered two transverse process fractures in 2014 but missed just one game in leading the Cowboys to a 12-4 record and NFC East title. In 2015, he suffered a broken left collarbone against the Philadelphia Eagles and missed seven games. He broke the collarbone again in his second game back and missed the final five games as the Cowboys went 1-11 without him. After undergoing collarbone surgery last spring, Romo said his back felt as strong as it had in years. However, on the third play from scrimmage in a preseason game against Seattle, he was awkwardly driven to the turf by Cliff Avril and suffered the compression fracture in his back. Romo's absence allowed Prescott, the Cowboys' second fourth-round pick last year, to ascend to the starting job. After losing the season opener, the Cowboys won a franchise-record 11 straight games. Prescott finished his rookie season with 23 touchdown passes and just four interceptions and was named the NFL's Offensive Rookie of the Year. Disappointed he would not have the chance to win the job back, Romo defused any controversy with a heartfelt statement backing Prescott upon his return. He served as the backup for the first time since 2006 and saw action in just one game, throwing a touchdown pass on his lone drive in the 2016 finale against the Eagles. "He has grown so much as a player and as a person over the course of his career and has made a significant impact on the lives of so many," Garrett said. "I consider myself fortunate to be at the top of that list. It has been one of the great privileges of my life to work with Tony Romo, one of the greatest players in Dallas Cowboys history." 0 Response to "Cowboys announce release of Tony Romo, who joins CBS Sports for 2017 season"